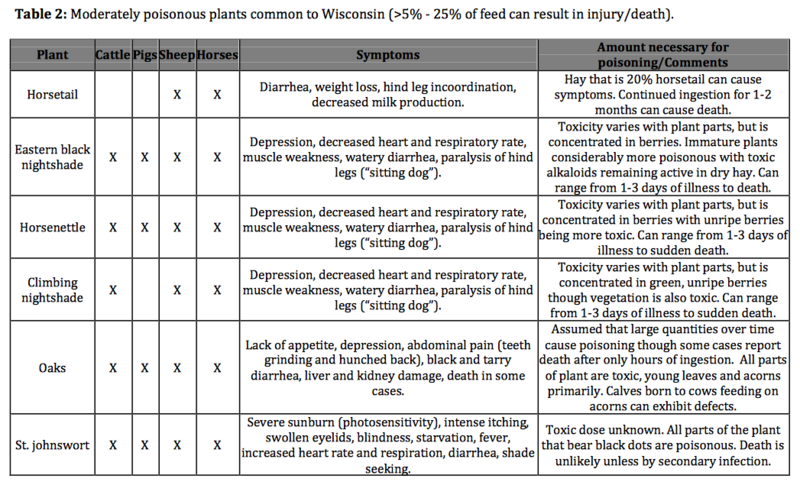 While most plants are safe for consumption by livestock, a few plant species can sicken or even kill animals. This publication overviews what poisonous plants are and under what conditions they can be toxic to livestock. 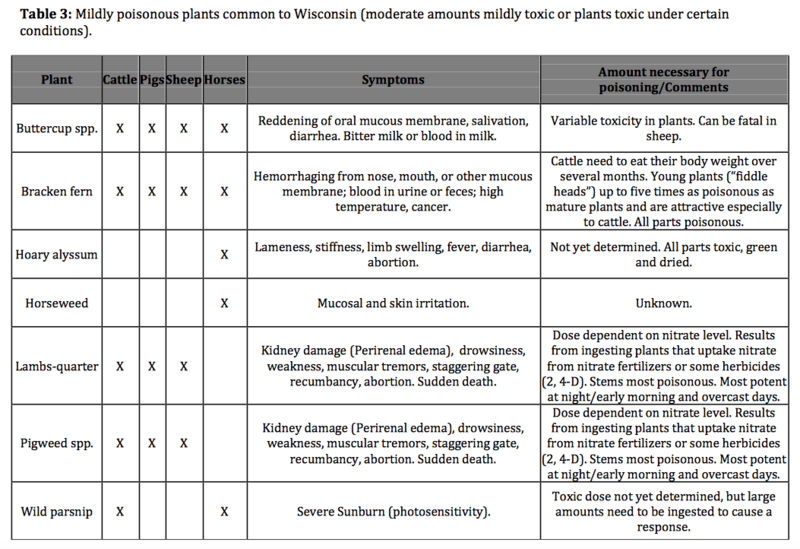 A detailed list of common poisonous plants found in Wisconsin along with a description of the level of toxicity and resulting symptoms of ingestion is also included as a reference. If plant poisoning is suspected contact a veterinarian or other specialist immediately, as a rapid response is often required to prevent serious injury or death. What Makes a Plant Poisonous? Highly toxic – small amounts (< 5% of feed) can result in serious injury/death. Moderately toxic – moderate amounts (> 5% – 25%) can result in injury/death. Mildly toxic – under certain environmental or management conditions these plants can be toxic. Fortunately the concern about toxicity is often a result of specific situations. Understanding what conditions can lead to plant poisoning can help reduce the risk of harm or death in susceptible herds. If any of these issues apply to you we recommend management practices to alleviate poisonous plants of concern. First grazing in the spring. When animals are put onto pasture for the first time in spring, poisonous plant tissue is young and more palatable. 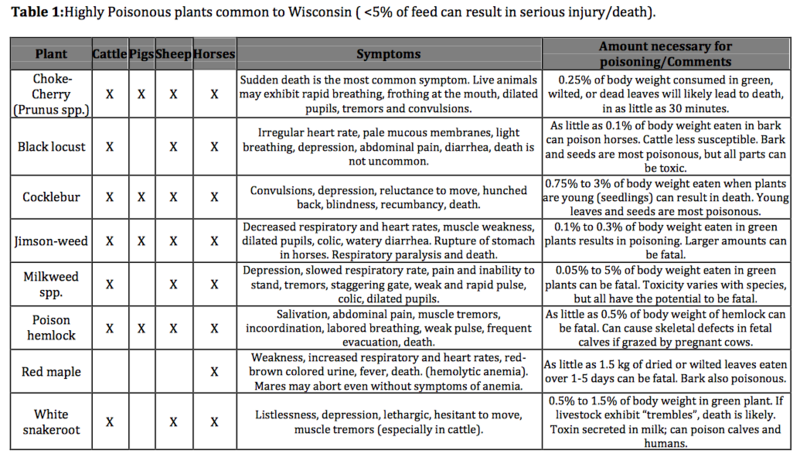 Livestock can feed on these plants at this time, especially if other desirable forage (e.g. forage grasses) hasn’t started to grow. To avoid this scenario we recommend controlling poisonous plants or not allowing animals into these areas until ample desirable forage is present to reduce the risk of animals feeding on poisonous plants. When animals are hungry, for any number of reasons, their selectivity decreases and they may eat plants they’d otherwise avoid. Make sure adequate forage is available, especially when poisonous plants are present. This is common especially under drought conditions, in the fall, or when pastures are overgrazed. Many weeds are not palatable and are avoided, but after an herbicide application their palatability can increase dramatically. If poisonous plants are treated with an herbicide we recommend not grazing for at least a 14-day period to avoid this occurrence. Read the product label for more specific recommendations and always follow label directions. Fields with an abundance of nitrate-accumulating plants including pigweeds, common lamb’s quarters, and common ragweed can become toxic after fields are fertilized or following drought conditions. These common weeds take up excessive nitrogen and convert it to nitrate. If enough of these weeds are eaten this can result in nitrate toxicity. If these weeds are present and consist of at least 20% of the feed in a fertilized field, they should be controlled before allowing animals to graze. Many ornamental shrubs and plants are both highly toxic and palatable to livestock. Avoid feeding or dumping yard waste/clippings into pastures or animal holding areas, as this is one of the most common scenarios for livestock poisoning in the Upper Midwest. Animals unfamiliar to a pasture or other area. Animals that are being boarded at a new location are often susceptible to poisoning. When grazing a new area or newly seeded pasture, introduce animals gradually and monitor for any physical changes or change in behavior. Toxic plants in harvested forages. Few options exist for preventing the presence of poisonous plants in purchased hay. To make matters worse it is difficult for animals to avoid poisonous plants when they are dried and mixed with desirable forage. Knowledge of the source of the hay is the only realistic way to prevent this situation. Prevention is always the best policy and the purpose of this paper is to point out some of the plants that are potentially harmful to livestock so that measures to avoid or at least minimize animal exposure. If control measures are needed, contact your county agricultural extension educator for assistance. If animals exhibit unusual symptoms, call a veterinarian.